I've written a lot about Personalized Learning on this blog. The theory has a lot of things going for it. It's intuitive, it's the principle behind the most effective learning factors, and supporting evidence continues to accumulate. When introducing personalized learning it's useful to contrast with factory-model education. Under a factory model, students with wide variation in personality, interests, skills, and talents are exposed to a consistent educational experience. 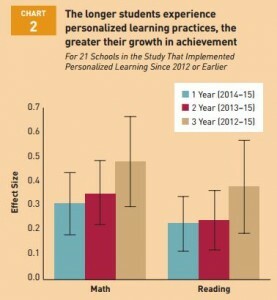 Unsurprisingly, there is wide variation in the results because the consistent learning activities resonate better with some students than others. So, we grade the students with some portion of the grade attributable to student effort and other parts attributable to evidence of subject mastery. When students with inconsistent backgrounds participate in consistent learning activities, it's not surprising that the results are also inconsistent. Personalized education applies in two ways. For fundamental subjects like Reading, Writing, and Mathematics, the learning experience should be personalized to meet the diverse needs of individual students. Customizing the experience to each student's individual needs can result in consistent achievement in a diverse population. With a foundation of core skills in place, the second form of personalization is supporting students as they pursue diverse interests - science, music, art, history, sports, and so forth. The most successful students have always personalized their education. The innovation is for institutions to deliberately participate in the personalization effort. Earlier this year, the Bill & Melinda Gates Foundation commissioned a RAND Corporation study of 62 public charter and district schools pursuing a variety of personalized learning practices. The results are promising. Average performance of students in the study schools was below the national average at the beginning of a two-year study period and was above the national average at the conclusion. Growth rates increased in the third year achieving effect sizes exceeding 0.4 in the third year. Increased one-on-one time between student and instructor. Personalized learning paths with students able to choose from a variety of instructional formats. Competency-based learning models that enable individual-pacing with supports tailored to each student's learning level. Flexible learning environments that can be adapted to student needs, particularly when they have conflicting demands on their time. College and career readiness programs. The authors observe that, "While the concept of personalized learning has been around for some time, advances in technology and digital content have placed personalized learning within reach for an increasing number of schools." The most significant policy event this year was the reauthorization of the Elementary and Secondary Education Act (ESEA). The previous iteration was known as "No Child Left Behind", this version is titled the "Every Child Succeeds Act". About the new law, iNACOL wrote, "Through ESEA reauthorization, Congress [supports] the shift to new, personalized learning models by redesigning assessments, rethinking accountability, and supporting the modernization of educator and leadership development." Another important event this year is Education Reimagined. The Convergence Center for Policy Resolution brought together leaders from across the political and educational spectrum to describe a new vision for education. As they describe it, "We were not your typical group -- no two in agreement about how to fix the current system. What we did share, however, was a fundamental commitment for all children to love learning and thrive regardless of their circumstances. We knew it was time to stop debating how to fix the system and start imagining a new system." I had the privilege of hearing Becky Pringle, vice president of the National Educaton Association and Gizele Huff, director of the libertarian Jacquelin Hume Foundation describe their shared vision of student-centered education. It's compelling that, when you get all of the parties to converge on a shared educational vision it focuses on personalization - on meeting the specific needs of each student. As we head into the new year, I'm optimistic. At this moment, we have progress, evidence, and policy coherently driving toward a better education for all of our students.